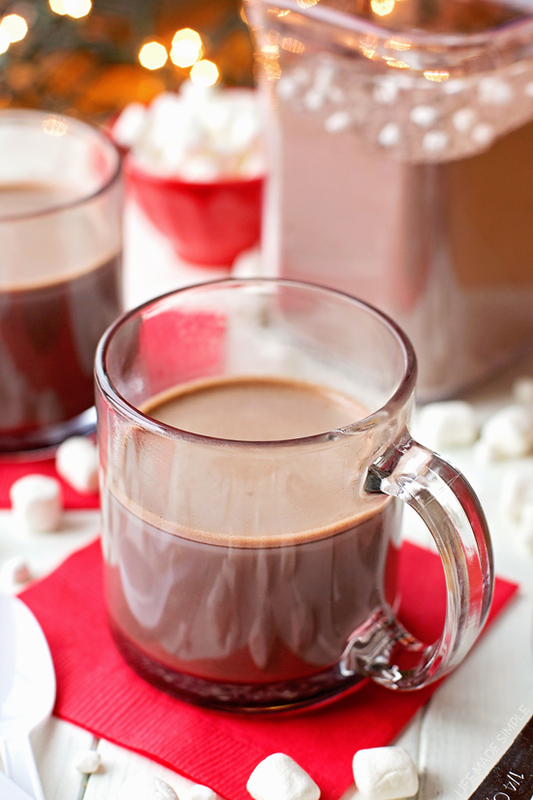 Hot cocoa is one of my favorite things to sip on during the holiday season. When the snow starts falling I always start craving it! But I haven’t really found a store-bought cocoa that I really love. They’re all good, but are often expensive and full of all sorts of preservatives. So this year I thought I’d make my own cocoa mix using a few pantry staples along with one or two secret ingredients. The results? The BEST homemade hot cocoa mix I’ve ever had! It all starts with a few cups of dry milk powder. I prefer using whole milk powder but often times nonfat is easier to find. Whole is slightly more rich and creamy while nonfat is a little more on the bitter side. That’s where the white chocolate comes in. Not only does t helps sweeten things up (along with the powdered sugar) and make this cocoa extra smooth and creamy. Make sure you buy white chocolate, not vanilla chips… there’s a difference! Next is comes the cocoa powder, probably the second most important ingredient! I prefer unsweetened dark or Dutch cocoa but natural works too if you prefer more of a milk chocolate flavor. And like I always say, use quality ingredients (especially cocoa), because you can definitely taste it in this recipe! The last two ingredients you’ll need are salt and pure vanilla powder. That’s my secret ingredient. It’s what makes this recipe taste 10x better than any other recipe out there. Nielsen-Massey makes one that I love, and I use it in place of vanilla extract in dry mixes and baked goods. It’s worth the extra money, I promise! (It can also be found in the bulk spice section of stores that carry bulk foods) If you happen to have ground vanilla bean you can definitely use that too, I know I’ve used it in recipes and it’s excellent! Once you have your ingredients measured out, mix them together in a large bowl and then puree them in batches until the mix is nice and smooth (basically until the white chocolate is finely ground). That’s it! Store it in an airtight container for up to 6 months and enjoy at your leisure! Whether you’re making a batch of this cocoa for your family or for holiday gifts, everyone is going to love it! If you’re feeling extra fancy you can buy those dehydrated marshmallows and mix those in, or package up some fluffy homemade marshmallows for people to add in later. I hope you’ll give this quick and easy recipe a try! Enjoy & happy holidays! 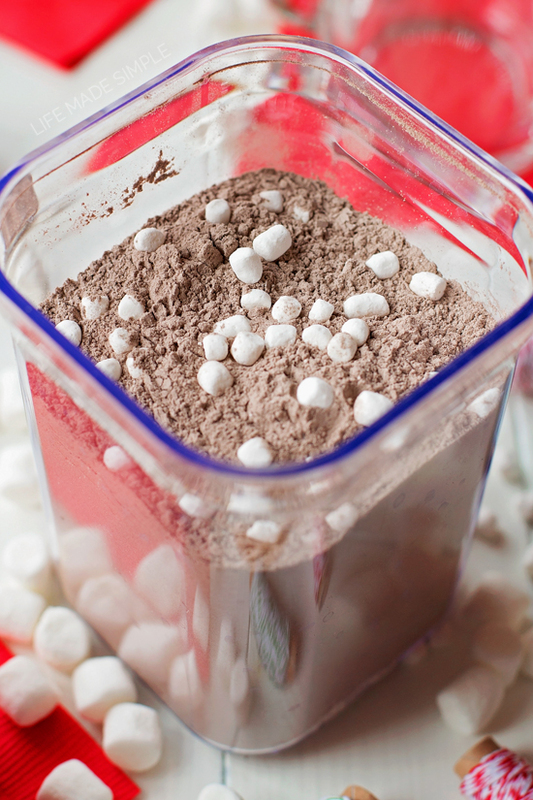 Quick, easy and delicious, this is the best homemade hot cocoa mix you'll ever try! It's especially perfect for holiday gift giving! In a large mixing bowl, whisk together all ingredients. 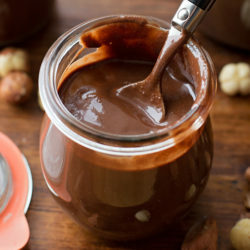 Working in 2-3 batches, pulse the ingredients in a food processor until the chocolate is finely ground. Add mini dehydrated marshmallows if desired, stir to combine. Store the cocoa mix in an airtight container for up to 6 months. 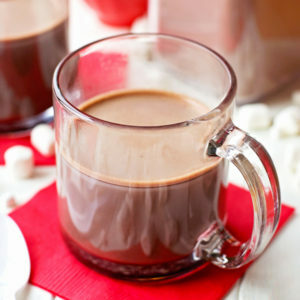 To prepare the hot cocoa, put ¼ cup to ⅓ cup of the mix in a large mug and stir in 1 cup of hot milk or water. 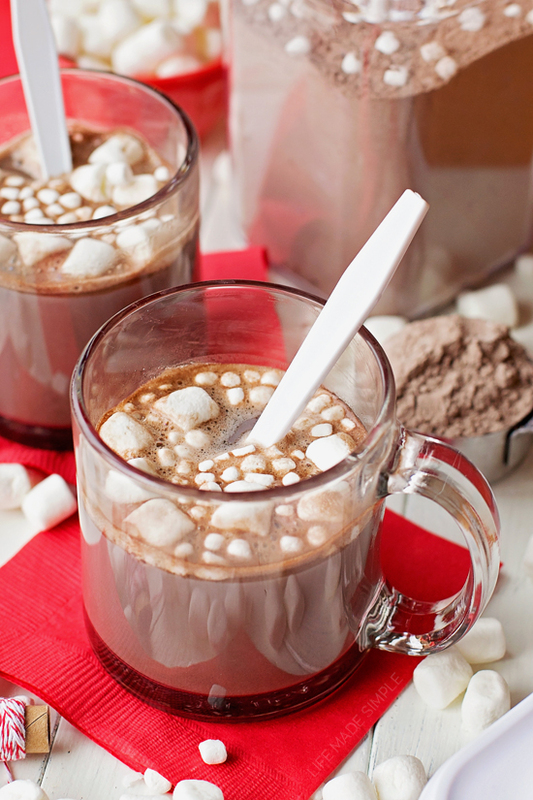 -Try adding ground candy canes for peppermint hot cocoa! -If using ground vanilla bean in place of pure vanilla powder, use 1 tsp. Vanilla powder can be found at most stores with bulk food sections as well as specialty stores like Sur La Table and Williams-Sonoma. *Using high quality cocoa powder is always better than going with the cheap stuff. Quality ingredients yield quality results! Natural cocoa powder can be used in place of dark or Dutch-process for more of a milk chocolate flavor. ***My favorite brand of vanilla powder is Nielsen-Massey. You can find this ingredient at most well stocked grocery stores, specialty food stores or even online. It really makes a huge difference in the overall flavor of the cocoa. It's worth the money and can be used in all sorts of dry mixes or baked goods! I LOVE these photos Natalie, and I love that you’ve shared a homemade version of hot cocoa…something I’ve never done! Pinning immediately. I’m making this for my coworkers and putting some in sealable jars. Do you think I could add just some regular miniature marshmallows instead of dehydrated ones? This truly is the best hot chocolate ever! Rich and smooth mmmm. Beats anything store bought and any other recipe I have tried. Thanks Connie! Just out of curiosity, did you use non-fat milk powder or another kind? Could you use semi-sweet chocolate chips instead? I don’t have any white chocolate and I don’t want to go to the store. The white chocolate helps give it the creaminess. If anything use milk chocolate in place of it… unless you like it extra dark 🙂 Maybe add a bit more dry milk to it? I usually use Scharffenberger or Guittard. Hope that helps! I made this last year and it really was amazing cocoa mix! I agree that quality ingredients really make all the difference, and seemingly ‘small’ things like the vanilla powder can take a recipe over the top from being just good to really being gift worthy. 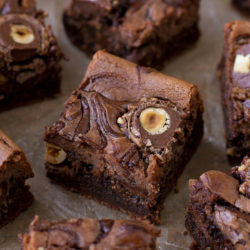 I’m making this along with chocolate spoons to send as holiday gifts. I was able to track down whole milk powder online. We mix ours with whole milk making it really creamy. I did find popping the white chocolate in the freezer for a few minutes prior to mixing in the blender helped. Our blender is high power and can make things really hot at high speeds. It avoids any clumping. I also sifted the mix to make sure everything was really blended. Thanks for a truly outstanding recipe!! I need to pick up some vanilla powder!!! Be prepared to shell out a lot of cash. The price of vanilla has skyrocketed. It definitely has! Just a few years ago it was half the price! Thank goodness I live near a restaurant supply store- sometimes I can find it cheaper on Amazon as well. Don’t have whole milk,only non fat dried milk. How can I kick this up a notch? I really want to use your recipe for my Christmas gifts this year. I bought chunks chocolate in the bulk food department. Do I grate it? And if so, how? These are rather large and while trying to read up on it, it talks about the mess and the melting trying to grate it by hand. How much mix and water do you use to make a cup? About 1/4-1/3 cup of powder and 1 cup of water or milk. Looks super yummy! Pinning and sharing with my group. Maine is currently under a deep freeze so we could all use a little warming up. Found this recipe and had to try it. I give it a 10,, excellent flavor. Just the right amt of sweetness and chocolate. I used a Dutch process cocoa powder. 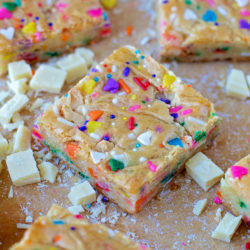 I used from Allisons Pantry – Augason farms Country Fresh nonfat dry milk powder and Alison’s Pantry Sweet Vanilla Powder and Bakers premium white chocolate squares. I made a cup just to make sure it was good. My mugs handle 1 2/3 cups liquid so I used a 1/4 cup scoop and another tsp just because I like it chocolatey!, thanks again so much….. I can’t get the vanilla powder. How do you use the vanilla bean? Do you ground up the whole bean? The vanilla bean will be moist (you generally scrape the insides of it out). For this particular recipe you need powder. If I made a large 16 cup batch of the homemade cocoa mix…how much of white chocolate would I need….I bought Ghirardelli white chocolate powder to use in place of white chocolate chips. Oh, I’ve never seen white chocolate powder! For a single recipe as written, I’d suggest using about 1/2 cup. Hope that helps! can I omit the white chocolate and still retain the great flavor? It’s essential to the recipe as written, however, you could omit the vanilla powder, reduce the powdered sugar by a half cup and add 1/2 cup of powdered coffee creamer instead. This is fantastic! Needed a little more powdered sugar, but otherwise perfection! I found that I only needed about 2TBSP for 8oz of water. I am making up little bags as gifts for xmas. FYI I got most of the ingredients other than sugar, salt, and dark cocoa from Amazon: (Whole powdered milk: https://smile.amazon.com/gp/product/B00FRFRZF6/ref=oh_aui_detailpage_o00_s01?ie=UTF8&psc=1, powdered vanilla: https://smile.amazon.com/gp/product/B0001WOLMU/ref=oh_aui_detailpage_o00_s01?ie=UTF8&psc=1, dehydrated marshmallows: https://smile.amazon.com/gp/product/B00VMUAL2O/ref=oh_aui_detailpage_o00_s01?ie=UTF8&psc=1 and I can vouch those products worked really well.) I used my food processor to grinds white chocolate chips into a powder – Trader Joe’s has real, cocoa butter white chocolate chips (but only in the fall/holiday season) and the bag is only a couple bucks, so go stock up now! Can you tell me what makes you dark chocolate mix lighter brown color? Mine turned out very dark looking. My recipie is very similar to yours, with the exception of the white chocolate. I see Ghirardelli makes sweet ground white chocolate powder. I would think it would work well in this recipe but am not sure of the amount since it’s a powder. D you suppose 1c might be a good guess?